Obviously, these pancakes came from my mom. 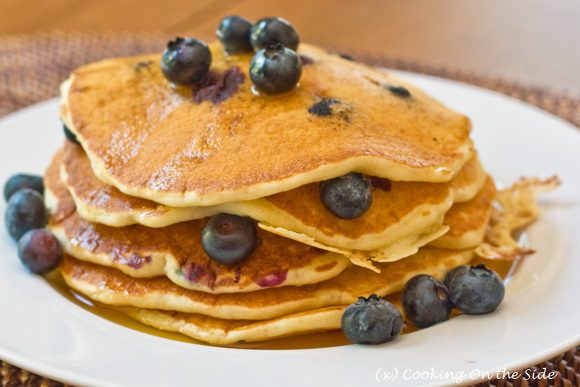 They are very good; she still makes them for me about once a week, and if I feel like pancakes, I will definitely use this recipe. My mother likes to be very healthy, so she threw in some extra healthy, yet yummy, ingredients like whole wheat flour and wheat germ. To put in personalization, add your favorite fruit or chocolate chips! 1. Put flours, wheat germ, baking powder, baking soda and salt into medium bowl. Combine milk and vinegar in another small bowl. Mix. Add eggs and oil. Mix. Add liquid ingredients to dry. Beat until smooth with egg beater or normal beater. 2. Grease frying pan lightly. Pour batter by 1/3 cupfuls. Bake until small bubbles/holes form (about 40 seconds, depending on your oven). Turn to bake other side – put on plate after about 30 seconds. August 10, 2011. Tags: healthy, Mom's, Pancakes. Breakfast.